War, Power, Greed, Jihad, Inquisition, Crusades and Extremists, all words we associate with religion. Shamans, priests, prophets and magicians, servants of the gods, mediums of power, or frauds? 22 religions, examined, exposed and deciphered. 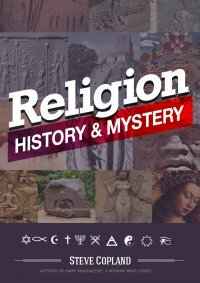 Religion: History and Mystery explores the ancient and modern religions which have dominated the world for 6000 years. A new book exploring the major religions of the world from before the flood and through to the New Age religions. This book draws together the history and mysteries which connect religions such as the Aryans, Zoroastrians, Hindus, Babylonians, Buddhists, Judaism, Christianity, Gnosticism, Kabbalism, Islam, Bahai, Mormons, etc, the New Age religions and Atheism. What do they all have in common? What are the mysteries which link them together? This book also points out why Judaism and Christianity are so incredibly distinct from every other religion. Is there a Divine Mystery contained in the Bible which is absent in all other religious texts?